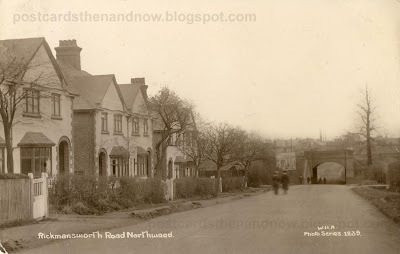 Northwood, Middlesex circa 1912. These houses would have been new when the photograph was taken. The railway bridge is not as aesthetically pleasing as the old one. Also see this post for a view of Northwood cinema around the same time. Postcard by W. H. Applebee of Ashford, Middlesex. Click the picture to enlarge. What stands out is the obvious lack of traffic. People ambling down the main road and under the bridge- they wouldn’t do that now!